This month's Daring Cooks' challenge is hosted by Debyi from Healthy Vegan Kitchen. 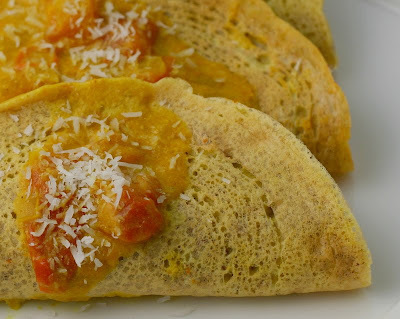 Debyi picked vegan Indian dosas which consist of a gluten-free crepe, a curried garbanzo filling, and a coconut curry sauce. For the recipe, click here. I had never made dosas before, much less a vegan recipe, so I was in. Wow, was this dish flavorful! Although the recipe had three different parts, the ingredient list was fairly simple. The only items I didn't normally have in my kitchen were soy milk, some non-gluten flour, and unsweetened grated coconut. After the prep, the cooking was easy. 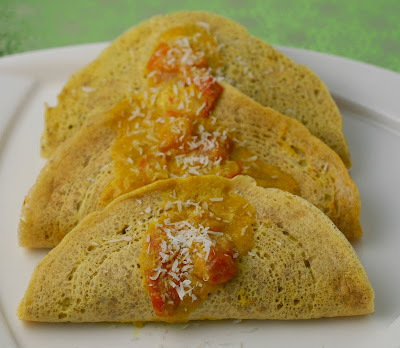 Since I couldn't find the spelt flour the recipe called for, I used a combination of garbanzo bean flour (1/2 cup), rice flour (1/4 cup), and flaxseed flour (1/4 cup) for the dosas. The crepes came together beautifully. I'm not really sure what they're supposed to be like, but the ones I made were a little crispy on the outside and soft on the interior. Finally, the coconut curry sauce was the perfect accompaniment. Since there was plenty leftover, I'm going to throw some chicken and potatoes in it for some chicken curry to eat over rice. Without the Daring Cooks, I would have never tried this wonderful dish. If you're not a Daring Cook, come join us! You'll have a lot of fun. For more information, check out the Daring Kitchen website. I love what you were able to do with this challenge. Your photos are terrific. I hope you enjoyed the dosas. Yum! 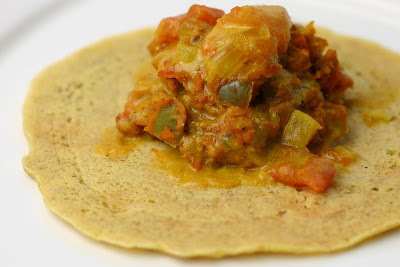 Your dosas sound perfect =D. Wonderful job with this challenge! It sounds like an interesting challenge. I'm not sure I would think of making the recipe on my own. A great way to stretch your culinary legs. It looks daunting!! How did you do it AND make it look good?! Kudos! I woke up in the middle of the night! !